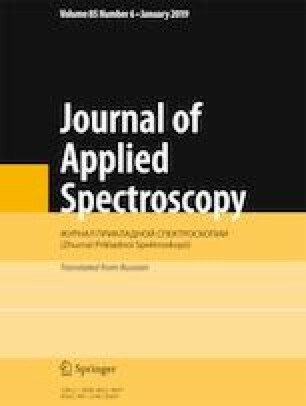 IR Fourier reflectance spectra (50–500 cm–1) of ZnS ceramics synthesized by chemical vapor deposition (including those with additional hot isostatic pressing), hot pressing, and physical vapor deposition are presented. The samples are assumed to have a cubic crystallographic structure (sphalerite) because of the phase composition of the raw materials and the temperature prehistory of them. However, a weak band at ~295 cm–1 that is characteristic of hexagonal ZnS crystals (wurtzite) manifests itself in both the reflectance spectra and the spectra of optical constants of all samples. Sphalerite → wurtzite recrystallization below the nominal phase transition temperature (1023°С) may be a consequence of the tendency ZnS to form the polytypical structure, which is facilitated in this ceramic material by the highly heterogeneous structure of the crystallites themselves. Translated from Zhurnal Prikladnoi Spektroskopii, Vol. 86, No. 1, pp. 66–70, January–February, 2019.